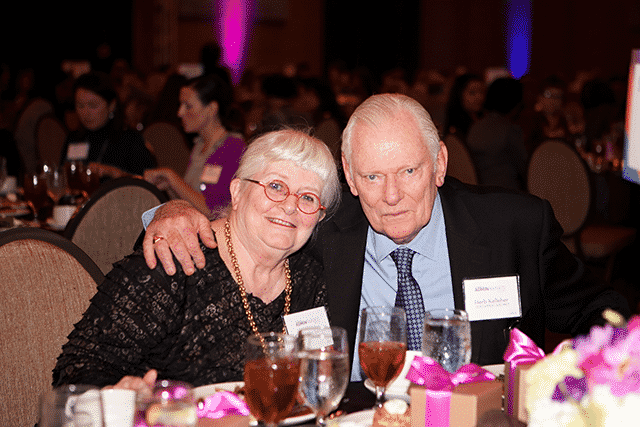 Houston | Admin Awards - The first and only awards program in the U.S. that publicly recognizes the invaluable contributions of Administrative Professionals. The Colleen Barrett Award for Administrative Excellence is the most coveted and prestigious honor bestowed by The Admin Awards and is named after a legend in the administrative profession, a woman who first proved herself indispensable as corporate secretary to former Southwest Airlines CEO Herb Kelleher before ascending the ranks to President and COO of the Dallas-based company in 2001. Throughout her five-decade career at Southwest Colleen advanced from Legal Secretary to VP of Administration, to EVP of Customers to President and COO and President of one of the world’s most successful airlines. Since 2008 Colleen has served as President Emeritus of Southwest and is revered for her leadership and decision-making abilities, along with her dedication to ensuring the needs of customers, employees, and all other stakeholders are met. Colleen has won many business and industry awards including one of the most important, historic and visible aerospace awards in the world, the Wright Brothers Memorial Trophy which reflects a timeline of the most innovative inventors, explorers, industrialists, and public servants in aeronautics and astronautics. Colleen is also a fierce advocate for the administrative profession and she understands first-hand the extraordinary impact that high performing Admins have on an organization’s success. The Colleen Barrett Award honors Administrative Professionals who are following in her hallowed footsteps. Barrett has long credited Kelleher with helping her to succeed: “If you have a boss who will let you stretch,” she said, then you have opportunities to learn. With the Colleen Barrett Award, bosses also have an opportunity to show superstar admins how much their dedication to excellence means — and how far they too can potentially rise. The award will be presented by Barrett to an Administrative Professional who best exhibits those traits that helped her have an extraordinary impact in her role as an Admin and include: high proficiency, shares the same values as their organization, is passionately committed to their organization’s purpose, demonstrates a legendary passion for customer service internally and externally, and has a heart for employee advocacy. The Admin Awards, referred to by many as “The Academy Awards for Admins” is accepting a limited number of Major Prize contributions which will be awarded during “Prize Breaks” throughout the awards ceremony. Past prizes have included all-expenses-paid vacations, electronics, spa packages, gift cards, airline tickets, designer purses and much, much more! Our Prize Breaks have become legendary and represent a potent way to endear your brand to these deserving and connected Administrative Professionals while also enjoying the captive audience of 450-650 executive and administrative attendees during the ceremony (size varies by market). 14 companies are showcased during three “Prize Breaks” which happen intermittently in between the nine award presentations to an audience of Administrative Professionals, their executive counterparts and coworkers. Prize Partners receive prominent display of their logo and giveaway on the big 16’ screens for about one minute while the prize contribution is drawn. Every Admin that attends the Gala is automatically entered to win one of the 14 major prizes. An est. 250 – 350 admins attend each Gala. Prize Partners are given the contact list of Admins including email addresses for future follow up. Prize Partners will receive one ticket to attend the Gala. While not all prizes are accepted, those that we believe would delight our community of Administrative Professionals and include a value of over $500 (although many are in the $1,000 – $2,500 range) are what gets us most excited. There sometimes is a cost to participate in the Major Prize program depending on the prize, est. prize value and other factors. To view more details or to submit your major prize for consideration, click here. 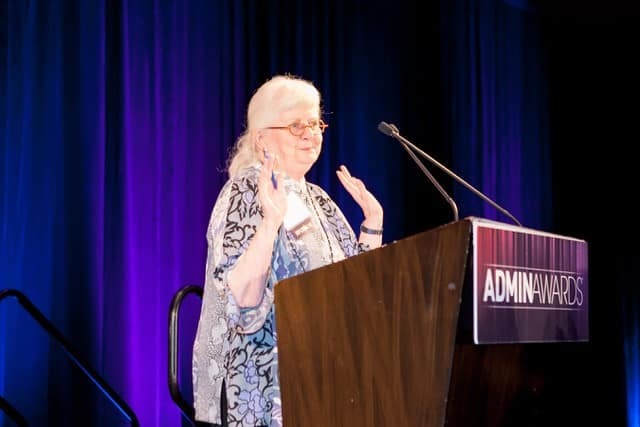 The Admin Awards recognizes administrative excellence in nine individual award categories, which may vary slightly from market to market to reflect the leading industries in each program area. Below is a list of all existing award categories and their respective markets in addition to the Founders Award which is the only company award offered by the Admin Awards and is described below. Nominators do have the ability to nominate an Administrative Professional in more than one award category although an admin can only be declared a finalist in one award category (the award category with the highest score from the judges is retained). Debra Fulcher has been an admin for 23 years. She currently serves as Office Manager at RSM US. Even while managing an endless list of tasks, when Hurricane Harvey hit Houston, Debra was part of the core communication team—checking in with employees to ensure their safety and get an idea of personal impacts from the storm. She then joined the fundraising team and helped to raise nearly $200,000 in disaster relief funds that were distributed directly to the employees. This unforeseen new responsibility was handled quickly and flawlessly - a testament to Debra's attention to detail, compassion and willingness to go above and beyond for her team. Please join us in congratulating Debra Fulcher, winner of The Community Champion Award! Kathy Adair began her career at National Oilwell Varco in 1978 and currently serves as Marketing Assistant at National Oilwell Varco, where she’s been for the past 40 years. The oil and gas market has experienced a few downturns during her career and each time Kathy has stepped up, taken on more responsibility, and guided those who haven't experienced them before. Leadership across NOV can attest to Kathy's loyalty, integrity, and work ethic. If Kathy's name is associated with a project then no one questions whether it will get done, knowing she will exceed expectations. This type of trust has developed from years of doing her best and doing what is right. Kathy made an impact on her very first day and it continues 40 years later. She is timeless, she is committed, and an absolute one of a kind. Annette McCammon has been an admin for over 30 years. She currently serves as Executive Assistant at Hi-Crush Partners LP. Annette is a rock of stability at Hi-Crush. She approaches everything she does with enthusiasm and professionalism. She is completely dedicated to making her colleagues’ lives easier. Her sense of ownership and focus on efficiency make her a trustworthy and valued asset every day. Annette is universally loved and appreciated because she treats everyone with the respect they deserve and values their views and opinions. She also mentors several assistants in the office, teaching them important skills but also serving as a role model. Two receptionists have recently been promoted because of the guidance and training Annette provided! Melodie Wesson currently serves as Dispatch Customer Service Representativeat US Med-Equip, where she’s served for the past 10 years. She is most people’s first contact with US Med-Equip, a 24-hour equipment resource company that serves hospitals in 14 states. Shehas significantly raised the bar for how they serve a patient in need. She has a natural empathy and honesty with people that can quickly diffuse an emergency so patients get what they need as soon as possible. Melodie’s heart is complemented by tremendous industry knowledge regarding equipment, operational processes, and hospital personnel. This allows the company to serve hospitals with greater accuracy and efficiency in situations where every minute counts. Wendy Millhouse has been an admin for over 20 years (one nomination says 20+ and another says over 25. Her bio says she’s been an EA for the majority of her 35-year career in the oil and gas industry). She currently serves as Executive Assistant - Office of the CEO and Special Projects at Archrock, where she’s been for the past 17 years. Wendy has worked in the oil and gas industry for 35 years. She’s had the unique experience working at Enron when it dissolved, working through the merger of Universal and Hanover to create the formation of Exterran, followed by working through the spin-off of Archrock. Wendy has demonstrated the agility and perseverance required not only to survive this industry but demonstrate how to thrive through the turbulence. She plays an instrumental and key role in supporting, managing, and leading many critical special projects for Archrock. Additionally, Wendy eagerly leads many lunches and learns for office staff. As they say at Archrock… she ROCKS! Melissa Menchaca has been with the UT MD Anderson Cancer Center for over 20 years and has served as Senior Executive Assistant to the former President and current Director of the Khalifa Institute for Personalized Cancer for the last 7 years. Melissa efficiently processes the complicated travel plans and calendar of her high-level executive which can include early mornings, late evenings, and trips to his home for signatures. This is all "in a day's work" for Melissa. As a smart, resourceful and flexible assistant, Melissa’s talents were especially useful when her colleague had to take medical leave from the institution. The scope of her work was suddenly altered, and she had to come up with creative ways to provide continued assistance in a newly changed work landscape. To help her colleague transition to an altered way of functioning professionally and personally, she took it upon herself to coordinate with nurses, physicians, and I.T. professionals who shared new technology available to help her colleague receive communications from a different medium. Melissa has gone above and beyond in her current and newly emerging role. She continuously challenges herself to learn new skills to ensure her team has streamlined services. In addition to this, she has developed into a manager of her small team and facilitated the promotion of one of her own staff members. Candice Evans, MBA, is an Office Manager at UT MD Anderson Cancer Center for the Division of Pathology & Laboratory Medicine Research. She started her career in healthcare in 1996 at Texas Children’s Hospital. In 2007, Candice joined UT MD Anderson where she continued to pursue her Bachelors of Science degree in Business Management and Administration. In 2010, she received her second degree, a Master’s in Business Administration while working for MD Anderson. Candice is highly motivated and brings over 22 years of progressive administrative experience. She leads by example and has the keen ability to anticipate areas of concern and quickly devise a resolution. Candice has remarkable people skills which comes from her passion for helping others. In her downtime, she caters to the needs of the elderly. 2007 Sr. Secretary 2008 Procurement Technician 2010 Sr. Administrative Assistant 2012 Grant Program Coordinator 2013 Office Manager. Spirit AwardJennifer Brabham, Condon & Company, P.C. Diana was born and raised in Houston, TX. She has worked downtown as an admin since 1983. The last 10 years with Kayne Anderson. She believes that no matter how much the exterior landscape changes, nor how much the industry and technology evolve; the one thing that should remain consistent is the intent of the work. Software comes and goes, adjustments need to be made but the purpose, (intention), of the value brought by your individual work performance results in the value you bring to the team. To help shape that picture, a love for people has to be number one. Sharing information is number two. Holding the cards close to your vest may work in poker but it is not what builds confidence in a team atmosphere. Diana has also found that keeping your sense of humor is far better than keeping pace with technology or even being part of the so called “in-crowd”. Lastly, one key piece of advice she can lend it’s that you should always remember to never leave anyone out and always treat all with respect - from the mailroom to the boardroom and that you should give to the community you live in. In her third year as the firm's Office Administrator, Jennifer Brabham supports the daily operations and growth for Condon & Company, P.C. by utilizing her experiences with administrative, IT and legal functions in multiple industries. Jennifer's love of people, paired with an enthusiastic mindset, makes it easy for her to consistently promote a positive work environment and cultivate company culture. In 2016, through these exemplary efforts, Condon recognized her as an Employee of the Quarter. Jennifer, a native Houstonian, attended the University of Houston. She now resides in the Kingwood-area with her two daughters and is an active citizen in her community. She has held the office of HOA President, President of her children's PTA and has sat on the Board of Humble ISD's PTA. When Jennifer finds spare time to spend, she enjoys gardening, cooking and cheering on the Green Bay Packers. In 2013, following 20 years in the transportation industry, Cynthia Johnson came to US Med-Equip, a 24hr medical equipment rental company serving hospitals systems in 12 states and employing over 150 people. Her ability to manage both logistical projects and human employee needs has allowed her role to grow as she supports the Operations Division and leads Human Resources. Cynthia is Six Sigma Silver certified, is a certified Associate Professional of Human Resources (aPHR) and is a member of SHRM and FIERCE. She is working on her PHR and plans to follow with her SPHR. Cynthia’s Six Sigma process improvement project was showcased in Germany in 2008 at the National Deutsche Post competition. In 2016, she successfully managed the migration of US Med-Equip’s HR from a PEO to in-house HR, saving the company over $300K. On the Volunteer Team, she increased US Med-Equip employee donations to Shriner’s Children’s Hospitals in 2014-2015 by over 300%. Cynthia is an integral part of developing a family atmosphere in the company as she balances her own family and continues to add value to US Med-Equip where the mantra “We serve a patient in need” is as close to her heart as her Southern Texas roots. Shannon Thurmond serves on the management team at Heikkinen Energy Advisors in her role as Office Manager. Heikkinen Energy Advisors (HEA) is an energy research & advisory firm focused on high-quality independent research of Exploration & Production, Oilfield Service and Midstream companies and assets. As the Office Manager, Shannon’s role includes financial reporting, accounting, tax, human resources, compliance, research management and office management. HEA is headquartered in Houston, Texas with offices in Dallas and New Orleans, Louisiana. Shannon studied at Texas State University where she received a Bachelor of Health Administration in 2005. Prior to joining HEA, Shannon began her career as Personnel Director as well as Payroll and Banking Executive Assistant at Harlingen Family Dentistry. Soon after becoming a Houstonian, she served as an Executive Assistant for the E&P Research Department at Tudor, Pickering, Holt & Co. She is a South Texas native that truly believes in the age-old saying, “hard work pays off”. It is this hard work that has propelled her into her current role and enables her to wear many hats within the organization. In her spare time, she enjoys relaxing with her husband and two children ages 6 and 10. Sofia started her journey with Cardtronics in 2015, supporting Executive Vice President Jeffery Keith and his Global Operations team. She currently supports Executive Vice President of Financial Institutions Sales Bill Knoll. When told she had an allocated budget of $80,000 set aside for an operations project, Sofia led the development of a vendor sponsorship program, raising the budget to $150,000 and crafted an event that was dubbed the “greatest show on Earth!” Sofia also organized a sales conference, where she turned two days of presentations and lectures into actual product demonstrations and sales training. She has enjoyed working with hundreds of employees at Cardtronics and being a part of many company-wide projects and initiatives, while also making sure day-to-day operations improve each day. Prior to Cardtronics, Sofia worked for major public companies in the retail, oil and gas, and financial services industries, playing a part in Human Resources, Marketing and Finance teams. Like many others, she has seen firsthand how crucial Administrative Professionals are to any organization! Sofia was raised in Columbia, South Carolina and holds a Bachelor’s degree in Finance from the University of South Carolina. She made the decision to become a Texan six years ago, and has been thoroughly enjoying it ever since! In her free time, Sofia enjoys interior design, parks, dancing and food. Sofia is happy to be a part of The Admin Awards, which celebrates those who are dedicated to their company, leaders, employees and clients! Janet Spaulding has been in the Administrative field for over 35 years, the past 26 serving at the Executive level. She currently serves as Executive Assistant to the President and CEO of The McNair Group, and CFO of the Houston Texans. In addition, in 2016, she accepted responsibilities for role of Office Services Manager and facilitates daily activities with building management. Prior to joining The McNair Group, Janet held tenured positions in the waste industry, with Browning-Ferris Industries (“BFI”), as an Executive Assistant/Legal Assistant positions for VP levels which included the Environmental, Health & Safety, Labor & Employment and Hazardous waste segments. Positions more recently held at Waste Management for C-Suite Executives include: Sr. EA to SVP, HR, Sr. EA to EVP & CFO, Sr. EA to GC; and Sr. EA to SVP, Business Development. She recently spoke on a panel of two for the EA Summit, hosted by the Administrative Professional Conference (“APC”) in Dallas on the topic of “The Motivated EA”. She and her husband are native Texans, born in Dallas and are the parents of three daughters and one son. Deborah Svatek-Logue is a Senior Administrative Assistant to the Director of the Land Organization at Marathon Oil Company, where she has worked since 2007. She began in 1986 working for the Volunteers in Public Schools (VIPS) at Fort Bend Independent School District. Deborah didn’t realize at the time how instrumental this job would be in molding her into the community champion she is today. Volunteering is a way of life for Deborah, especially when the cause involves children or our military. She is currently the volunteer coordinator for Marathon Oil’s Junior Achievement (JA) program at Browning Elementary. JA is a not-for-profit organization whose purpose is to inspire young people to succeed in a global economy. Actively involved in JA for more than ten years, Deborah leads a team of about 45 employees to teach the JA lesson plan in all 22 classes at Browning each Fall. She also participates in other educational programs such as JA Pen Pals, Reading Tutor and the My Home Library program, recently launched by the Barbara Bush Houston Literacy Foundation. Each December, Deborah coordinates a Toys for Tots drive at Marathon Oil to help ensure children in the Houston area have a happier and brighter holiday season. In addition to her love for children, Deborah has a passion for helping veterans. Due to a personal connection through her husband and family, she feels she should help those who serve and protect our country and have sacrificed so much. For the last eight years, Deborah has served on the 5K Committee for Impact A Hero. The organization provides support for severely wounded post-9/11 combat veterans, their families and caregivers. Deborah not only helps coordinate the 5K, but she also fundraises. In fact, she has been the top individual fundraiser for the past four years raising more than $40,000 for this worthy cause. In her free time, Deborah enjoys spending time with her family attending football games and dancing. She and her husband are also very active in their church serving as Chairs for the Annual Church Bazaar for the past two years. Deborah is married to Michael and has one son, Chris who will be married in May. She is also mom to her fur baby, Sport! Prior to joining Newmark Grubb Knight Frank as an Executive Assistant and Associate, Jessica was a General Business undergraduate at the University of St. Thomas - Houston. Notable accomplishments during Jessica’s college career include becoming a Who’s Who Among Students in American Universities and Colleges award recipient, and being nominated as her graduating class’s Most Outstanding General Business Student. Jessica joined Newmark in May 2014 as a temporary Administrative Assistant. Jessica was hired in July 2014 as the youngest Sr. Administrative Assistant the office ever hired, and she paved the way for other recent college graduates to be considered for support positions. She was quickly promoted to Executive Assistant when the office gained a Texas Regional Manager and President, US Head of Retail and Hospitality, and Vice Chairman in September 2014. Jessica obtained her Texas real estate sales person license in February 2016, and she provides transactional support to the retail team and advisory services to her clients while managing her executive’s travel arrangements, schedule, and personal needs. She manages a national retail account, helps create offering memorandums and valuations, partners with the retail team on assignments, helps clients look for sites, and attends industry networking events.